One of the many great delights of being pregnant was that it put my endometriosis in remission. Now that I am breastfeeding, my hope is to enjoy at least another full year of feeling fabulous. I also hope to keep my knees together and stay out of the stirrups, 'cuz I'm a lady. These days, my mind is usually occupied with happy things, but sometimes I worry about what awaits me when the endo becomes active again. 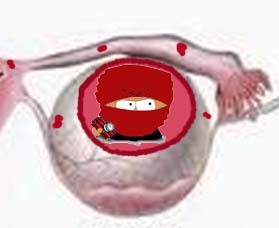 I picture the endometrioma(s) on my lone ovary as suicide bombers just waiting for the chance to blow it all to hell. And of course there are all the other endo implants lurking who-knows-where. 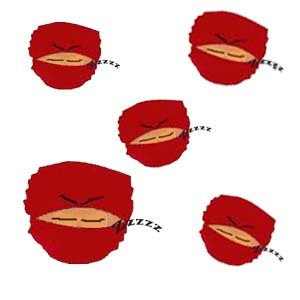 Right now they're sleeper cells, but they may become quite menacing once activated. I've already had some familiar, though short-lived pain since Mei-mei was born. Alarmed that the sleeper cells may be reactivating so soon, I reported this to the proper authority. According to my doctor, the pain is likely caused by my innards yanking on some adhesions as they shift back into place. As far as reproduction is concerned, Q and I are taking a laissez faire approach. I'm 99.9% certain that we can't make another baby just with tools we have around the house. While we would welcome another living child, we have no intention of messing things up by risking another traumatic loss. Not that it's up to us anyway - thanks infertility! The objective now is to relax and enjoy our lives sans fertility treatment. For me, no more charting, no more injections, and no more planning my life around doctor appointments. For Q, no more Wacking Day, no more Uplifting Reading in The Back Room, and no more dealing with an erratic hormonal wife. Ok, so maybe he's not totally off the hook on that last one. Since our story has reached a very happy ending and there will be no trying again, the time is nigh for signing off on this blog. But first we will be having a little contest and giveaway, so stay tuned! I am so sad that you are going to close your blog! I'm all for a random post here and there, rather than a total "unplug", but I understand wanting to shut it down, too. Just know that I will miss you terribly! I hope your endometriosis stays away for a long time. So glad you have your happy ending. I will miss your posts.